The corner of 21st and Edgehill avenues in 1925. Vanderbilt University Medical Center began in 1874 when the School of Medicine, which had been part of the University of Nashville since its founding in 1851, was incorporated into Vanderbilt University, which had been founded in 1873 with a grant from Commodore Cornelius Vanderbilt. The first degree awarded by this new University, in 1875, went to Henry William Morgan, and was a medical degree. For many years of its existence, Vanderbilt’s medical school and hospital were located near the present day intersection of Fifth Avenue and Elm Street, near downtown Nashville. During this time, the School of Medicine was owned and operated as a private property of the practicing physicians who made up the faculty and received the fees of the students—a system that, while not ideal, was typical of medical education in the U.S. at the time. In 1895, the School of Medicine was reorganized under the Vanderbilt University Board of Trust. William L. Dudley, who was professor of Chemistry in the college of Arts and Sciences, was appointed medical dean; admission requirements were raised to require a high school diploma; the course was lengthened to three years of six months each; and laboratory work in the basic sciences was added to the curriculum. At this time, Vanderbilt was one of four medical schools in Nashville, joined by the University of Nashville, which again separated from Vanderbilt in 1895, the University of Tennessee, and Meharry Medical College. Three years later, in 1898, the quality of education was again upgraded. The course requirement for graduation increased from three years to four years and the number of months of instruction each year increased from six to seven. Improving the quality of instruction and therefore the quality of graduates of the School of Medicine received a boost with the 1910 publication of the report of Abraham Flexner, who, with a grant from the Carnegie Foundation, surveyed American medical education and proposed that the training of physicians become more rigorous, standardized, and scientific. Flexner’s comments concerning Vanderbilt were not without criticism, but the report noted that Vanderbilt was the best suited facility in the state to train Tennessee’s doctors. The Flexner report was taken to heart by Dr. G. Canby Robinson, who was appointed Dean of the School of Medicine in 1920. Five years later, on September 16, 1925, the aspirations of the Flexner Report, the will of Canby Robinson, and the funding of Rockefeller Foundation General Education Board and the Carnegie Foundation came to life, as the School of Medicine was relocated to a new building on the Vanderbilt main campus that housed not only the school, but the hospital, outpatient clinics, laboratory, and library. That building survives as Medical Center North, although most of its original functions have since relocated to dedicated buildings of their own as the Medical Center has grown. 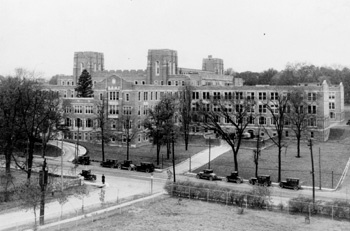 The 1925 state-of-the-art facility was located adjacent to the building for the Vanderbilt University School of Nursing, also completed in 1925. The school, which was founded in 1909, was one of the nation’s first nursing programs to incorporate its curriculum into a liberal arts degree. While part of the college of Arts and Sciences until officially joining the Medical Center in 1984, the School of Nursing throughout its history was closely affiliated with the patient care activities of the Medical Center. The years between the reorganization of the Medical Center and the beginning of the Second World War were active ones at VUMC. Waller Leathers replaced Canby Robinson as Dean in 1928, the same year the department of Pediatrics was established. The department of Radiology was established in 1936. The first major addition to the Medical Center building was made in 1938, as the D corridor was added at the rear of the structure to house, among other things, more patient rooms and the departments of Pediatrics and Obstetrics and Gynecology. One of VUMC’s first major research grants was received in 1932 from the Rockefeller Foundation. The $250,000 earmarked for clinical research was administered by a faculty committee. In 1933, Dr. Alfred Blalock and his research assistant Vivien Thomas conducted pioneering research leading to the first cardiothoracic surgery for infants born with “blue baby syndrome.” Blalock’s work was essential to the development of open heart surgery. In the early 1940s, Dr. Ernest Goodpasture, who became Dean in 1944, developed the method of culturing vaccines in chick embryos, which allowed the mass production of vaccines for smallpox, typhus, and yellow fever. The coming of war reduced the number of students and faculty on the Vanderbilt campus, and, as had been the case in World War I, VUMC faculty and staff had an organized presence in the war effort. In 1941 the Vanderbilt 300th General Hospital unit was organized and participated in the European theater. The first major development after the war was the 1945 establishment of the department of Anesthesiology. The department was new, but anesthesiology as a specialty had been one of the best known areas of VUMC; the first ether-oxygen apparatus, an early anesthesia machine, had been developed at VUMC in 1907 by Dr. James Tayloe Gwathmey. More great names of Vanderbilt also made an appearance during this era. Dr. Amos U. Christie, chair of Pediatrics, led a team that achieved worldwide notice for pioneering work in histoplasmosis. Dr. John B. Youmans became Dean in 1950; Dr. Barney Brooks retired as chair of Surgery and was replaced by Dr. H. William Scott Jr.; and Dr. Elliot Newman received the series of grants from the U.S. Public Health Service that led, in 1960, to the establishment of the federally funded Clinical Research Center which bears Newman’s name. Dr. John Patterson was named Dean in 1958. The first endowed chair in the School of Medicine was established in 1960, the George W. Hale Professorship in Ophthalmology. In 1961, the Learned Lab was added to Medical Center North and the next year the West Wing, later more descriptively dubbed the Round Wing, opened. These additions added to both research and patient care space. Patient care of newborns was revolutionized in 1961 at VUMC as Dr. Mildred T. Stahlman founded the division of Neonatology and began the Vanderbilt NICU, the first in the nation to make use of respiratory therapy for infants with damaged lungs. In 1963, Dr. Randolph Batson was named Dean and Director of Medical Affairs, a position which evolved into the current position of Vice Chancellor for Health Affairs. The 1960s saw several additions to the Medical Center. The Werthan Wing was added to Medical Center North in 1964, and in 1967 Medical Center South was renovated and became part of the Medical Center. That same year, the Zerfoss Student Health Center, named in honor of Dr. Thomas B. Zerfoss, who was a University physician from 1926 to 1962, opened. From 1970 to 2000, the pace of growth and change at VUMC increased rapidly, as did the institution’s national and international reputation. In 1970, the founding of Vanderbilt Children’s Hospital brought pediatric care to the forefront of the Medical Center’s patient care mission. In 1971, Dr. Earl Sutherland was awarded the Nobel Prize in Physiology or Medicine, thereby serving notice that the Medical Center’s research mission was on a par with its patient care and education missions. In 1974, Dr. Vernon E. Wilson became Vice Chancellor for Medical Affairs, and the next year Dr. John E. Chapman became Dean. The two men began an impressive program of construction of new facilities that continues to the present. The first of the new series of buildings was Rudolph A. Light Hall. The building, which opened in 1977, contained School of Medicine classrooms and laboratories. This was followed by Vanderbilt University Hospital in 1980. Dr. Roscoe R. “Ike” Robinson became Vice Chancellor for Health Affairs in 1981, and the building boom continued: the Child and Adolescent Psychiatric Hospital in 1985; The Vanderbilt Clinic in 1988; Medical Research Building I (now named the Ann and Roscoe Robinson Medical Research Building) in 1989; the Kim Dayani Human Performance Center in 1989; Stallworth Rehabilitation Hospital in 1992; Medical Research Building II (now the Frances Williams Preston Building) in 1993; and the Annette and Irwin Eskind Biomedical Library in 1994. Dr. Stanley Cohen received a Nobel Prize in 1986, as he shared the award with Dr. Rita Levi-Montalcini of Italy for their discovery of epidermal growth factor. The School of Nursing, which under the leadership of Dean Colleen Conway-Welch became a part of the Medical Center in 1984, phased out its undergraduate nursing degree in 1989 and became exclusively a graduate school with a mission of educating advanced level nurses. One of the innovative programs of the school is the Bridge program, which admits students from educational backgrounds other than nursing and allows them to complete a course of work leading to an advanced practice nursing degree. In 1986, the School of Nursing founded a donor society called the Julia Hereford Society, named after the Dean of Nursing from 1949 to 1965, and in 1999 dedicated Patricia Champion Frist Hall, a new classroom and office building adjacent to Godchaux Hall, the 1925 School of Nursing building. The School of Nursing also added a course of study leading to a Ph.D. in Nursing Science, and combined with the School of Engineering to offer a course of study leading to an M.S.N. in Nursing and a Ph.D. in Biomedical Engineering. Dr. Harry R. Jacobson succeeded Robinson as Vice Chancellor for Health Affairs in 1997, and took over a Medical Center that was in many ways more successful than ever in its history, but also facing unique challenges. Despite the growth and innovations in patient care, education, and research over the past decades, numerous challenges also faced the institution. Pressure from private insurers, health maintenance organizations, and government put pressure on the economics of patient care. In response, the Medical Center took steps to create clinical pathways to streamline and improve the efficiency of patient care, reorganized faculty physicians into the Vanderbilt Medical Group, and located practices into communities away from the campus to be more convenient for patients. At the same time, government funding of research grew more competitive, even as VUMC faculty research dollars grew, and Vanderbilt began to reach out to private and entrepreneurial sources of research funds. U.S. News and World Report has consistently ranked the School of Medicine in the top 20 in the nation during the 1990s, and likewise Vanderbilt’s patient care in a number of specialties was highly ranked in that magazine’s annual reports. The School of Nursing has also been ranked in the top 25 from among 237 nursing programs in the U.S. There are 50 fully endowed chairs and professorships at VUMC. Twelve more are annually funded and 14 additional chairs are committed through requests. The opening of additional research space allowed a growth in research and research funding; VUMC consistently ranks in the top 25 out of 129 medical schools in the receipt of National Institutes of Health funding. A new medical research building is under construction adjacent to Learned Lab. Patient visits have continued to grow with hospital admissions above 31,000 in 1999, and outpatient visits approaching 600,000. VUMC has the only Level I trauma center in the region, including the LifeFlight helicopter ambulance program, which began in 1984; the only Level 3 Burn Center; the only Level IV Neonatal Intensive Care Unit; and the only National Cancer Institute-designated center of its kind in Tennessee. And a new free-standing Vanderbilt Children’s Hospital, now long recognized as a community resource, is under construction at the south end of The Vanderbilt Clinic.